Ag Professional Magazine has identified Adapt-N as one of the Top Ten new products for 2012. See http://www.agprofessional.com/newsletters/agpro-weekly/articles/Vote-for-the-best-new-product-of-2012-183777161.html. Adapt-N is the only non-commercial product in the group. Voting is taking place right now for the Best New Product of the Year Award. You can vote for Adapt-N online at: http://www.agprofessional.com/poll/182026081.html. Check out the newest article on Bill’s Forage Files here. December 14, 2012 Adirondack Grazers Cooperative meeting from 7:00 – 9:00 p.m. at Annex II, 411 Lower Main St, Hudson Falls, NY 12839 to discuss the current situation and direction of the beef marketing cooperative as it completes its first 6 months of operation. For more info, please call Sandy at 518-746-2560 or Sarah at 917-941-0481. Tuesday, December 18, 2012,– Improving Your Business With On-Farm Research-at The Century House, Rte 9 Latham from 9:30 am – 3:30 pm. Learn how to do your own on-farm research and how to participate in state-wide research projects with Cornell faculty. We will discuss the skills, knowledge, and management it takes to do on-farm research. Put on by Capital Area Agriculture and Horticulture Program. Mark your calendars. Registration information is forthcoming. Contact Aaron Gabriel if you have questions, adg12@cornell.edu, 518-380-1496. Tuesday, December 18, 2012 Cornell’s Agri-Business Outlook Conference at Statler Ballroom, Ithaca, NY. For more info contact: Carol Thomson at 607-255-5464 or cmt8@cornell.edu. Wednesday, December 19th, 2012 Maximizing profit and minimizing loss: you need a plan! From 9:00am—2:30 pm at CCE Saratoga County, 50 West High Street, Ballston Spa NY 12020. Sponsored by The Capital District Veg & Small Fruit Program and Capital Area Ag & Hort program, it will include a Season Overview, Crop insurance discussion and Use of QuickBooks™ for business planning. There is no charge for this workshop, but you MUST pre-register by December 17th. Send attached form or contact Marcie at 272-4210 or mmp74@cornell.edu. OR register online at http://bit.ly/FMPP_QuickBooks .Lunch is included. The program is sponsored by FMPP and NYS Crop Insurance. I-9 Forms: What is an I-9 Form, Why Do You Need to Complete One, and How Do You Complete One? What are the Acceptable Forms of Identification and Documentation in Completing an I-9? Recordkeeping Requirements – Where Should These Records Be Kept, With What other Documents, and For How Long? What if the Audit Determines Your I-9s are Not in Compliance, or Your Worker(s) are Illegal? Jan. 2, 2013 Meat Processing and Food Safety Certificate Program at SUNY Cobleskill. For more info, contact 518.255.5528 or email serdyml@cobleskill.edu . This 4-unit, intensive hands-on training program is designed to provide the knowledge and skills students require to enter employment in the meat processing industry. Students will be skilled in sanitation, food safety, slaughter, meat cutting and processing. As part of the students’ preparation for the industry, the program consists of specialized training in the accuracy of cutting, knife handling, portion control, merchandising and the utilization of all products. Hands-on training in meat animal slaughter, primal fabrication, retail cutting, value-added products (sausage), wrapping and storage of finished product. Safety, sanitation including USDA HACCP (Hazard Analysis Critical Control Point), customer relations from custom cutting to product pick up and invoicing will be part of this program. January 8, 2013 Dairy Farm Business Summary Input meeting from 1:00 – 3:00 p.m. at CCE-Washington County, Annex II, 411 Lower Main St, Hudson Falls, NY 12839. The meeting is FREE and will provide some info and experience for dairy farmers thinking about entering their own data in the DFBS program or understand where and why data is used. To register, please call Sandy 518-380-1498 or e-mail sab22@cornell.edu . January 9, 2013 Dairy Farm Business Summary Input meeting from 1:00 – 3:00 p.m. at CCE-Rensselaer County meeting room, 61 State St, Troy, NY 12180. The meeting is FREE and will provide some info and experience for dairy farmers thinking about entering their own data in the DFBS program or understand where and why data is used. To register, please call Kirk 518-272-4210 or e-mail kjs264@cornell.edu . January 10, 2013 Dairy Farm Business Summary Input meeting from 1:00 – 3:00 p.m. at CCE-Columbia County, meeting room, 479 Route 66, Hudson, NY 12534. The meeting is FREE and will provide some info and experience for dairy farmers thinking about entering their own data in the DFBS program or understand where and why data is used. To register, please call Sandy 518-380-1498 or e-mail sab22@cornell.edu . Thursday, January 10, 2013 NYS Ag Society 181st Forum – Perception is Reality: Understanding How Consumers Perceive Agriculture from 8:30 am – 8:30 pm at Holiday Inn, 441 Electronics Pkwy, Syracuse/Liverpool. Details or pre-register at: www.nysagsociety.org Co-sponsored by the NYS Dept. of Ag and Markets. This year’s Forum will consider consumer views and how farms can help promote agriculture to the public. Keynote speaker: Larry Kaagan, a polling, trend-analysis and strategy-consulting firm for agriculture and food industries. NYS Ag Commissioner, Darrel Aubertine, will present the State of the State’s Agriculture Address. Discount for pre-registrations before December 21. Thursday, January 10, 2013 The eXtension Entrepreneurship webinar series hosts a free presentation on Getting Action from Website Landing Pages! with Jay Jenkins, UNL Extension. All webinars air monthly on the second Thursday at 2:00pm (ET); at https://connect.extension.iastate.edu/etc-cop . Ever wonder why some online businesses seem to have all the luck – well it may not be luck after all! Their content marketing payoff may be because their ‘landing pages’ encourage the customer to take ‘action’. Your landing pages can mean the difference between profit and loss! Learn how to send your customers to the right page and create the appropriate call to action! January 10, 2013 Landscape Architects Training at Cornell Cooperative Extension Albany County, 24 Martin Road, Voorheesville, NY 12186 . Registration is required. More information to follow as the program develops. For more information contact Chuck Schmitt at cds34@cornell.edu or at 518-765-3513. LA continuing education credits will be offered. Emily DeBolt, owner and operator of Fiddlehead Creek Farm and Native Plant Nursery, in Washington County will speak on native plants; what ‘native’ means; what the benefits are; what invasives are; why they are harmful and provide an update on what is going on at the state level with the lists for invasives. She will then give a presentation on using native plants in the landscape. David Cutter, a LA at Cornell University will speak about designing the Cornell campus to become carbon neutral by the year 2050. The CU Sustainability initiative includes campus mapping, green roofs, open meadows, and lawn substitutes. He will also touch on the new technologies used at the Brian C. Nevin Welcome Center (permeable pavement, structural soil, and the bio-swale area). January 12, 2012 Basic Farm Business Management Planning 9:30 a.m. to noon at CCE-Washington Cty. 415 Lower Main St, Hudson Falls, NY. Helping your farm business achieve success. Registration is $25. For more info contact Gale at 518-765-3500 or Sandy Buxton 518-380-1498 or sab22@cornell.edu. Cornell Cooperative Extension horticulture staff will present the latest on managing turfgrass and landscapes using organic methods. Participants will receive credits applicable to maintaining a current Be Green license agreement with the NYSDEC. Registration required. For more information contact Chuck Schmitt at cds34@cornell.edu and 518-765-3513 or David Chinery at dhc3@cornell.edu and 518-272-4210. This conference provides an opportunity for people responsible for day to day activities to increase their management and operations skills while interacting with other managers. Sessions on January 16 will be followed by a tour and interaction with a local dairy operations team on January 17. For more information, visit www.ansci.cornell.edu/prodairy/OMC/ If you are interested in carpooling with someone, please call Sandy – 518-380-1498 there are several producers thinking about it. Supervisory staff as well as field staff will be present at each meeting. We will be discussing our observations on the 2012 season and share our outlook and plans for 2013. We will also provide some information about the new electronic application for the H-2A guest worker program. Most importantly, we will be seeking input from you about your experience in 2012 and what you anticipate for 2013. January 17, 2013 CCE Annual Tax School at CCE-Saratoga County, 50 West High St. Ballston Spa, Ny 12020 From 9:30 a.m. to 3:00 p.m. For more info or to register contact Richard Smith, CCE – 518-885-8995. January 18th and 19th, 2013 17th Annual Vermont Grazing and Livestock Conference: Global Grazing – Lessons Learned From Around the World –– Lake Morey Resort, Fairlee, VT – Featuring keynote speaker Abdon Schmitt, professor at the University of Santa Catarina, Brazil, and many local and regional experts including sales coach Fred Ashforth, animal behavior expert Kathy Voth, nutritionist Jeff Mattocks, research results, super networking and much more. Two day-long intensive workshops on Friday and 24 workshops Saturday to choose from. Discounted attendance for VGFA or VBPA membership. Details at www.uvm.edu/pasture. Contact Jenn Colby at jcolby@uvm,edu to learn more. January 24, 2013 Lawn and Landscape Training at Columbia County CCE office, 479 Route 66, Hudson, NY 12534. For More information contact Chuck Schmitt at cds34@cornell.edu or 518-765-3513 or David Chinery at dhc3@cornell.edu or 518- 272-4210. This meeting will highlight current issues challenging the lawn care and landscape industry. Topics such as European crane fly identification, Boxwood Blight, new weed control products, Impatiens Downy Mildew, Hemlock Woolly Adelgid and control of Canadian geese on managed properties will be covered. · Steve Kenyon, a Holistic Management Educator/practitioner from Saskatchewan, Canada. Steve will discuss, in two separate sessions, the business and the practice of custom grazing cattle for profit. Additionally, Steve will touch upon Winter Management techniques that will have direct application to those of us in the cold Northeast. Jerry Brunetti, one of the original organizers of the PASA conference and founder of Agri-Dynamics, a dairy nutritionist and an expert in human nutrition too, is going to discuss these two intimately related topics of animal and human health. If we are what we eat, then we are what our animals eat. Jeremy Engh owns and runs Lakota Ranch in Virginia as well as running the Lakota Bull Test, an all-forage/grazing test for beef breed bulls. While Jeremy is a Red Devon breeder and grass-finisher, the Lakota Bull Test accepts bulls from all beef breeds and measures their performance in contemporary groups, while also conducting Breeding Soundness Exams and other pertinent pre-breeding season data collection. All this data is then provided to the bull owner/consignors and to the prospective customers of the Lakota Bull Test Sale. · Paul and Phyllis Van Amburgh, who own and operate Dharma Lea Farm in Sharon Springs, NY will discuss their approach to animal production on their Certified Organic, 100% grass-fed farm where they produce grass-fed beef along side their year round grass-fed dairy. · Dr. tatiana Stanton, NY State’s Small Ruminant Specialist will talk about her initial research into applied pasture lambing and how the results compare to jug lambing. tatiana will talk about these and other matters relating specifically to the pasture rearing and finishing of goats and sheep. January 25-27, 2013 NOFA-NY Winter Conference “Resilience” at Saratoga Hilton and City Center, Broadway, Saratoga Springs, NY. Visit www.nofanycoference.org to register and for more info. Early bird registration saves $10 by December 11. Registration due January 11th or call (585) 271-1979 ext 515 for more info. January 29, 2013 Bedding Plant Conference with CCE at The Century House, 997 New Loudon Road, (Route 9), Latham, NY 12110. Learn about innovations in greenhouse production, pest management, organic fertilization and other trends. 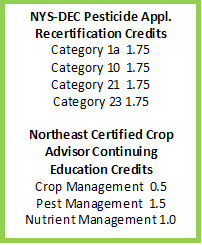 DEC pesticide credits applied for. For more information contact Chuck Schmitt at cds34@cornell.edu and 518-765-3513. Session 3: A Guide to Marketing Channel Selection. The demand for locally raised meats and livestock products continues to grow. Strategic and specific marketing efforts can help you take full advantage of the local foods market. If you want to sharpen and focus your marketing skills or just don’t know where to begin developing a marketing plan, CCE can help! CCE has developed a series of workshops that will teach the basics of strategic marketing, including how to identify a target market and focus your farm’s marketing efforts. You will also learn how to choose the markets that meet the needs of your farm, such as CSA, farmers’ market and wholesale. Each participant will develop components of a marketing plan and create marketing materials. While this series is tailored specifically to the marketing of meats and other livestock products, it will benefit any farm looking to improve their marketing efforts. February 5 -7 & 12 – 14, 2013 30-Hour Pesticide Class for Category 3a & 25 with Cornell Cooperative Extension–Rensselaer County, 61 State Street, Troy, NY 12180. Cornell Cooperative Extension horticulture staff of the Capital District will present a six day class to become licensed pesticide applicators. Successful completion of the thirty-hour training course and exams will allow participants to be licensed by the NYSDEC as Certified Pesticide Applicators. Registration required. For more information contact Chuck Schmitt at cds34@cornell.edu and 518-765-3513 or David Chinery at dhc3@cornell.edu and 518-272-4210. February 7, 2013Basic Farm Business Management Planning 6:00-8:30 p.m. at CCE-Washington Cty. 415 Lower Main St, Hudson Falls, NY. Helping your farm business achieve success. Registration is $25. For more info contact Gale at 518-765-3500 or Sandy Buxton 518-380-1498 or sab22@cornell.edu. February 11th, 2013 Lake George Fruit School, Lake George NY. Call Kevin Iungerman at 518-885-8995 for more info. February 12-13, 2013, Hudson Valley Tree Fruit School, Kingston, NY. Call Mike Fargione at 845-691-7117 or mjf22@cornell.edu for more info. February 13, 2013 Crop Congress at Miner Institute in Chazy, NY. For more info, call Dr. Eric Young at 518-846-7121 ext 113 or young@whminer.com . Speakers include: Dr. Randy Shaver, UWisc-Madison on Shredlage; Dr. Bill Cox, Cornell on Corn Production; Dr. Russ Hahn, Cornell on Weed Control. Thursday, February 14, 2013 The eXtension Entrepreneurship webinar series hosts a free presentation on Top 10 Trends & Cool Tools in Social Media! with Julie Fox, Ohio State University. All webinars air monthly on the second Thursday at 2:00pm (ET); at https://connect.extension.iastate.edu/etc-cop. This fast moving session goes beyond the latest statistics to demonstrate what’s working and show you how to benefit from the latest social media trends and tools. February 27, 2013, Capital District Annual Vegetable and Small Fruit Winter Meeting, Albany, NY. Call Laura McDermott 518-746-2562 or lgm4@cornell.edu for more info.
. Learn how to better utilize Pinterest for your business/ Just when you thought you’d gotten a handle on social media by giving Facebook and maybe Twitter a try, along comes Pinterest. Pinterest is now the number three most-popular social network in the U.S., behind only Facebook and Twitter, according to Experian’s Digital Marketer Trend and Benchmark Report. Presenters will introduce what Pinterest is and why you should use it for your business. They will also discuss setting up a Pinterest account, how to interact, and how to create pin boards. Gross is a young entrepreneur and owner of Country Drawers in Cambridge, Nebraska and Hancock is an Extension Educator from UNL Extension. For Sale: 100+ aluminum IRRIGATION PIPES. 4” X 40’ with Rainbird sprinkler heads and brass shut-offs. These are Champion Pipes with hook and latch system. Also includes metal header pipes and end caps and corners. SACRIFICE $6,500. Very anxious seller. Want to move before winter! Located ARGYLE, NY- CALL (518)638-9000. Most state offices of the U.S. Dept. of Agriculture Natural Resources Conservation Service (NRCS) have established application deadlines for the 2013 Environmental Quality Incentives Program (EQIP). Deadlines for your state are listed below. Applications are being accepted at all USDA Service Centers. EQIP is a voluntary program that helps growers address critical environmental concerns with NRCS financial and technical assistance for more than 80 basic conservation practices, including Integrated Pest Management (IPM). IPM Conservation Activity Plans (CAPs) and Herbicide Resistance IPM CAPs are also now available nationwide. These options provide a onetime financial assistance payment to growers to work with qualified Technical Service Providers (TSP) to design an IPM plan to address key natural resource concerns. NRCS accepts applications for EQIP on a continuous basis, but producers must file applications by the deadlines below to be considered in these initial ranking periods. Applications filed after the deadlines will be considered in the next ranking period if funds remain available. More information is available from NRCS in your state: http://www.nrcs.usda.gov/wps/portal/nrcs/sitenav/national/states/ <http://www.nrcs.usda.gov/wps/portal/nrcs/sitenav/national/states/> . State FY2013 General EQIP Signup Deadline. Note: Ranking deadlines are for general state 2013 EQIP signup. Separate deadlines for special local, state or national EQIP initiatives may exist. ALBANY – Federal funding of $1 million will enhance the competitiveness of New York’s agricultural products. The funding will support the research, development and promotion of specialty crops including fruits and vegetables, tree nuts, and nursery crops, and includes $200,000 to help support the growth of the state’s wine, beer, and spirits industry. At Governor Cuomo’s Wine, Beer and Spirits Summit in October, industry leaders told the Governor that more research and development is needed to continue the rapid growth of the industry here in New York. Of the $1 million in funding announced today, $200,000 will go toward this effort. In December 2004, the Specialty Crops Competitiveness Act of 2004 authorized the U.S. Department of Agriculture (USDA) to provide state assistance for specialty crop competitiveness programs. Competitiveness programs may include: research, promotion, marketing, nutrition, trade enhancement, food safety, food security, plant health programs, education, “buy local” programs, increased consumption, increased innovation, improved efficiency and reduced costs of distribution systems, environmental concerns and conservation, product development, and developing cooperatives. The January 2013 Issue of the Lewis County Ag Digest is now posted online at: http://counties.cce.cornell.edu/lewis/agdigest.htm. It has been more than 10 years since we have included a trade show at this event. However, we have received several requests by both farmers and agribusinesses to offer this opportunity again. We are pleased to announce that we will now be including an agribusiness trade show at the Crop Congress each year. Please join us to represent your business at our trade show. Exhibitor booth space is $50 and includes lunch for one participant. Additional registrations from your business will pay $20 per person. There is a large area available for exhibits and should be plenty of rectangular tables. However, it is advisable to come prepared for any specific adjustments you may want to make (i.e. extension cords, small folding tables, etc.) You will be able to pick your own table on a first come first serve basis. Reservation guarantees a space, but not a specific location in the room. Please click here for more information and the registration form. Don’t forget to pre-register for the 2012 Field Crop Dealer Meeting. You can pre-register online at http://nysaba.com/meeting_registration. There is a $15 registration fee for the meeting. The Field Crop Dealer Meeting will precede the New York State Agri-business Association Annual Meeting which will be held the following day, December 13th. Registration for both meetings is separate and you can register for one or both meetings. A tentative agenda for the 2012 Field Crop Dealer Meeting can be found at: http://fieldcrops.org/Calendar/Documents/2012%20FCDM%20Agenda.pdf. Please contact Mary McKellar at mem40@cornell.ed if you have any questions. Tuesday, December 18, 2012, 9:30 am – 3:30 pm – Improving Your Business With On-Farm Research- at The Century House, 997 Rte 9 Latham. Learn how to do your own field crop research and how to participate in state-wide research projects with Cornell faculty. Speakers include Cornell faculty; Dr. Quirine Ketterings, Dr. Gary Bergstrom, Dr. Mark Sorrells; Alex Wright, Carovail; as well as Sandy Buxton and Aaron Gabriel (Capital Area Agriculture and Horticulture Program). We will discuss the tools, knowledge, and management it takes to do on-farm research. Bring a research idea for your farm and develop a plan for it at the workshop. Learn how about the NY On-Farm Research Partnership at Cornell; how to do strip trials in field crops to test fungicides and other crop inputs; how to do small grain variety trials; what does it take to host a field trial with industry reps; and how to evaluate the economics of adopting new practices and products. Charlie Koines will give a crop and dairy insurance update. Put on by Capital Area Agriculture and Horticulture Program. $40 Pre-registration by Dec. 13, to CCE Albany Co., 24 Martin Rd., Voorheesville, NY 12186, or contact Gale (gek4@cornell.edu, 765-3500). Walk-ins $60. Contact Aaron Gabriel for program questions or business sponsorships (518-380-1496, adg12@cornell.edu). Comments Off on Online Registration for the 2013 Corn & Soybean Expo Now Open! Online Registration for the 2013 Corn & Soybean Expo Now Open! Register ONLINE here. You can pay with Pay Pal, or complete your registration online and mail in a check. A complete agenda and registration form for the expo can be found here. The December 2012 Issue of the Lewis County Ag Digest is now posted online: http://counties.cce.cornell.edu/lewis/agdigest.htm.